God calls us to be good stewards of all that he has given to us–our time, our energy, our talents, our relationships. God calls us to respond to the needs of our families and the world around us. Giving of time, talent and treasure to the church is an important discipline in the Christian life. God called the people of Israel to support the Temple with the first fruits of their harvest. Since then, this practice of giving has been a spiritual discipline, helping to deepen the faith of God’s people as they rely on God’s grace rather than their own wealth. Though God wants 100% of our lives dedicated to him, the Biblical standard of giving outside the family is the tithe: 10% of one’s income. If you are not used to tithing, select a percentage to pledge for the year ahead, and consider stepping up from your current percentage as you move toward the tithe. All gifts are appreciated, whatever their level. Please pray about what God is calling you to give. We invite pledges in October for the coming calendar year. Receiving pledges by November helps the vestry plan our ministry activities for the year ahead. New members can pledge on their new member forms. If you would like a pledge card, please contact the parish office and we’ll send you one or click here for the online pledge form. Sign up for scheduled transfers from your bank account to the church’s accounts. This is an easy and helpful way to stay current with your pledge, similar to programmed payments for mortgage or insurance. To register, we will need a hard copy form filled out and brought in or sent in with your signature. Click Here for the form. Support St. Peter & St. Paul while enjoying a tax benefit through a gift of stock. Contact Amy Pillsworth at apillsworth@peterandpaul.org for more information on how to sign over your shares to the church. St. Peter & St. Paul is blessed by special gifts that bring glory to God. There are several ways to give God thanks for loved ones through special and memorial gifts. We also maintain a Building Fund to offset capital needs, such as replacing aging HVAC systems and other significant maintenance costs and improvements. Each week, we invite gifts of $50 toward the costs of our Altar Flowers to the Glory of God and in thanksgiving or in memory of a loved one, or special occasion. Checks to St. Peter & St. Paul should note this purpose in the memo line. Contact the Parish Office if you wish for the gift to be noted in the service bulletin. ​Once our new sanctuary was finished, St Peter and St Paul embarked on a long term project to convert all the windows to stained glass. These windows tell will tell the Gospel story for years to come. We have commissioned Willet Hauser Architectural Glass to design a beautiful set of stained glass windows that will be fabricated and installed as funding is received. Your gift will give glory to God and can be given in memory or honor of a loved one. Click here to see photos and read more about the story of our stained glass windows. Make a general contribution to the Stained Glass Window General Fund if you would like to participate in the purchase of a window without the expense involved with a whole window. Donations can be made in any dollar amount and given at any time. Simply drop off your check designating “Stained Glass Window General Fund” in the Offertory Plate or to the Church Office. You can be the sole contributor or form your own group of contributors to purchase a window or a part of a window. For more information about these wonderful memorial gift opportunities, or to reserve a window purchase, please contact Kitty Tuttle at (770) 998-6445 or kittytuttle60@gmail.com. ​Click here to see renderings of windows available to purchase. In 2015, we began a program to improve the Memorial Garden, bringing extra beauty to this sacred space. We have completed the first two phases, renovating the planting beds, adding small trees, and upgrading the water fountain. We still have work yet to accomplish, improving the ground plantings, building drip line improvement and landscaping under the crepe myrtles on the east side of the pathway. We are seeking donations to total $1,500 or more to complete this work. You are invited to become a member of the Memorial Garden Team to help keep this space beautiful. Any financial gift toward this project, no matter what size, will be appreciated. 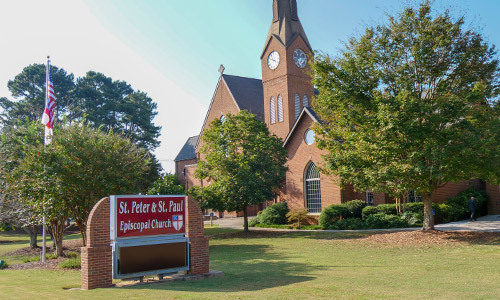 Checks may be made out to The Episcopal Church of St. Peter & St. Paul, noting in the memo line “Memorial Garden Renovation Fund.” Green envelopes will be in the pews for contributions to this project. Our beautiful buildings and ground require regular maintenance, and sometimes our infrastructure needs replacement or upgrades. Your gift to the Building Fund will help us keep our property welcoming and inviting, and free up operating funds for ministry. Contact Chuck Matheson at cmathe1234@gmail.com for more information. in 2014, we became debt free! Now we are thinking about the future by increasing our small Endowment Fund. Contact Roger Sherrard at rwsherrard@comcast.net for more information. Part of our Christian responsibility is making arrangements for our heirs and others in a will. You can remember St. Peter & St. Paul in your will, providing for future generations of disciples of Jesus Christ. This is especially helpful as an offset to the loss of annual giving when a member of the parish dies. To learn more about arrangements for bequests to the church, please contact Roger Sherrard at rwsherrard@comcast.net.